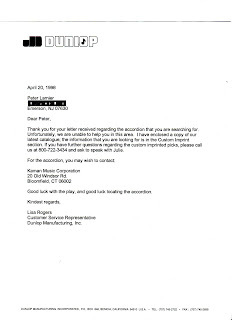 Peter Larnier is the alias I used for this letter. It's one of the rare times a letter came from him. He was referenced in many letters he just didn't write them very much. As is indicated below he's the music director (well one of them) for my musical about Gouda cheese. 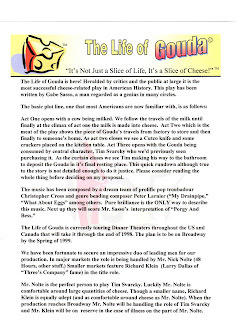 The synopsis below went out with every letter I mailed that referenced my musical "The Life of Gouda." With the absurdity at this level it's hard to believe anyone would respond. Richard Klein is for me the perfect B-List Celebrity. Partly because I loved Three's Company growing up and also because people think they know who he is and then guess the wrong person. A huge shout out to my pal Brian Vermeire for the graphics and design on the letterhead. He has done virtually all of that for me over my letter writing years. 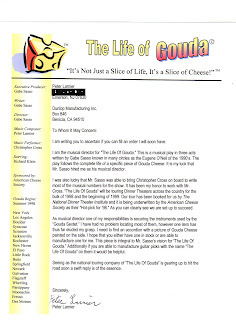 The Gouda Letterhead and flyer are just the tip of the iceberg. Like I said, hard to believe anyone would respond to this silliness, but I'm glad they did.